The Insatiable Critic: Video interview with Kung Fu Film Expert Ric Meyers! 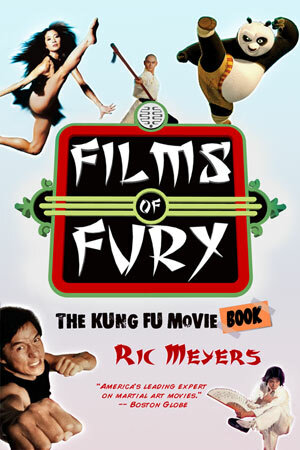 Video interview with Kung Fu Film Expert Ric Meyers! Ric Meyers, famous writer, fellow critic, and some say the American expert on Kung Fu films, graciously allowed me to interview him about his new book and corresponding movie, Films of Fury! before he trotted off to the San Diego Comic Con. At this biggest and baddest of the comic cons, at 7:45 p.m. in Room 6A, yesterday he premiered Films of Fury: The Kung Fu Movie Movie! We had a great time. UPDATE: So I had a great, edited, wonderful copy of the interview with a header and footer and lots of bells and whistles, and for some reason Windows Movie Maker will not process it. I begged, pleaded, and almost came close to throwing my laptop out the window. So here it is folks, the raw copy, uncut and unplugged. The first chunk is about 20 minutes long and the second is about 11 minutes long (don't have to watch it all in one go if you don't wish) long and no fancy intro but bug-free. Hope you enjoy! MANY thanks to Casey Schoenberger who played cameraman and managed to get the video uploaded to his YouTube channel, and for Ric for being patient and a good sport as always. Without further ado....parts one and two!